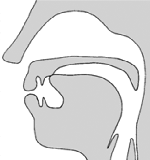 The lips are rounded, the vowel space is closed and the toungue arches toward the back of the mouth as vocal cords are vibrating. The lips are not rounded, the vowel space is closed and the toungue arches toward the back of the mouth as vocal cords are vibrating. The lips are not rounded, the vowel space is closed and the toungue arches toward the front of the mouth as vocal cords are vibrating. 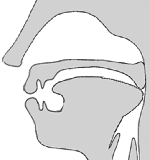 The lips are not rounded, the vowel space is nearly closed and the toungue arches toward the front of the mouth as vocal cords are vibrating. The lips are not rounded, the vowel space is almost open and the toungue arches toward the front of the mouth as vocal cords are vibrating. The lips are not rounded, the vowel space is between open and closed open and the toungue arches toward the middle of the mouth as vocal cords are vibrating. The lips are not rounded, the vowel space is nearly open and the toungue arches toward the front of the mouth as vocal cords are vibrating. The lips are not rounded, the vowel space is mildly open and the toungue arches toward the back of the mouth as vocal cords are vibrating. The lips are not rounded, the vowel space is open and the toungue arches toward the back of the mouth as vocal cords are vibrating. The tip or bladeof the tongue is tapped against the alveolar ridge during pulmonic egressive air flow, and vocal cords are vibrating. The tip or blade of the tongue is placed against the alveolar ridge as pulmonic egressive air flow passes around either side of the tongue, and vocal cords are not vibrating. The tip or bladeof the tongue is vibrated against the alveolar ridge by pulmonic egressive air flow, and vocal cords are vibrating. The vocal cords are brought into a constriction of close approximation, vocal cords are not vibrating. The tongue is raised in approximation with the soft palette, and vocal cords are vibrating. The back of the tongue is brought into a constriction of close approximation with the velar arch, and vocal cords are vibrating. The back of the tongue is brought into a constriction of close approximation with the velar arch, and vocal cords are not vibrating. The tip or blade of the tongue is brought into a constriction of close approximation just behind the alveolar ridge, and vocal cords are not vibrating. 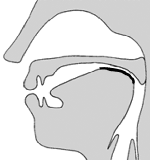 The tip or blade of the tongue is brought into a constriction of close approximation just behind the alveolar ridge, and vocal are not vibrating. The tip or blade of the tongue is brought into a constriction of close approximation with the alveolar ridge, and vocal cords are not vibrating. The tip or blade of the tongue is brought into a constriction of close approximation with the alveolar ridge, and vocal cords are vibrating. The tip of the tongue is brought into a constriction of close approximation with the upper teeth, and vocal cords are not vibrating. The tip of the tongue is brought into a constriction of close approximation with the upper teeth, and vocal cords are vibrating. Lower lip is brought close to the upper teeth in a constriction of close approximation, and vocal cords are vibrating. Lower lip is brought close to the upper teeth in a constriction of close approximation, and vocal cords are not vibrating. The root of the glottis forms a constriction of complete closure the nasal passage is closed, followed by a release, and vocal cords are not vibrating. The root of the tongue forms a constriction of complete closure with the uvular area and the nasal passage is closed, followed by a release, and vocal cords are not vibrating. The back of the tongue forms a constriction of complete closure with the velum and the nasal passage is closed, followed by a release, and vocal cords are vibrating. The back of the tongue forms a constriction of complete closure with the velum and the nasal passage is closed, followed by a release, and vocal cords are not vibrating. The blade of the tongue forms a constriction of complete closure with the alveolar ridge and the nasal passage is closed, followed by a release, and vocal cords are vibrating. The blade of the tongue forms a constriction of complete closure with the alveolar ridge and the nasal passage is closed, followed by a release, and vocal cords are not vibrating. A constriction of complete closure is made at the lips and the nasal passage is closed, followed by a release, and vocal cords are vibrating. 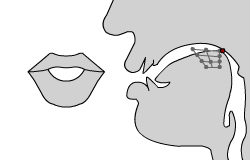 A constriction of complete closure is made at the lips and the nasal passage is closed, followed by a release, and vocal cords are not vibrating. The root of the tongue forms a constriction of complete closure with the velar area, the nasal passage is not closed, and vocal cords are vibrating. The blade of the tongue forms a constriction of complete closure with the alveolar ridge, the nasal passage is not closed, and vocal cords are vibrating. The lips form a constriction of complete closure, the nasal passage is not closed, and vocal cords are vibrating. The chart below shows the major allophonic variations common to Idrani. Throughout this site, IPA and Khijadi transcriptions of Idrani will be written phonemically. Therefore, to pronounce transcriptions properly, the following allophonic variations should be kept in mind. When a native speaker of a language talks, he/she pronounces some sounds differently whenever certain other sounds precede or follow them. This is done somewhat uncounsciously and is part of what accounts for the 'accent' associated with a language. The sound a native speaker percieves he/she is saying is called a phoneme. The sound a native speaker is actually pronouncing is called an allophone. Such pronunciation changes are known as allophonic variations. 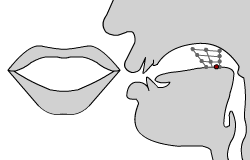 The rules below describe the conditions under which a sound that is a phoneme is pronounced as a particular allophone by a native Idrani speaker. Phonemes are shown between slashes and allophones are shown between square braces. The sound /ɑ/ is actually pronounced [æ] when it is between /s/ and any nasal sound. The sound /ɑ/ is actually pronounced [ʌ] when it is at the end of a word. The sound /ɛ/ is actually pronounced [e] when it comes before /j/. The sound /i/ is actually pronounced [ɪ] when it comes before /l/ or before /ɹ/. The sound /l/ is actually pronounced [ɬ] when it comes after /t/ or after /k/ or after /h/. The sound /n/ is actually pronounced [ŋ] when it comes before /q/. The sound /n/ is actually pronounced [m] when it comes before /p/ or before /b/. The sound /o/ is actually pronounced [ɔ] when it is between a consonant and /ɹ/ or between a consonant and /l/. The sound /ɹ/ is actually pronounced [ɾ] when it is between two vowels. The sound /ɹ/ is actually pronounced [r] when it is at thebeginning of a word. The sound /u/ is actually pronounced [ʊ] when it is between a consonant and /ɹ/ or between a consonant and /l/. The sound /u/ is actually pronounced [ǝ] when it is at the beginning of a word. A stop pronounced with air exhailed from the lungs is actually pronounced with air ejected from the mouth when it comes before /ʔ/. The chart below shows the Romanized writing system for Idrani called Khijadi. The Roman graphemes are shown in red. The phoneme assigned to each Khijadi grapheme is displayed below it in black, using the International Phonetic Alphabet. The chart is layed out in English alphabetical order, according to the Khijadi graphemes. You may click on any of the highlightable graphemes below, to see an articulation diagram and hear pronunciation of the given phoneme. The chart below shows which English leters can be used to write the sounds of the Idrani language. The English alphabet is sometimes called the Roman alphabet because the Romans invented it. When a non-english language is written using Roman letters, it is said to be Romanized. The Romanized writing system shown in this chart is called Khijadi. The Roman letters are shown in red. The sounds assigned to the Roman letters are displayed below them in black, using the International Phonetic Alphabet. You may click on any highlightable letter below, to see a pronunciation diagram and hear the pronunciation of that letter. The chart below shows a subset of the native writing system for Idrani called Sipokhi. The Sipokhi graphemes are shown in large print. Sipokhi graphemes in red have both phonemic and determinative values. Phonemic values for the Sipokhi graphemes are shown below them in black using the International Phonetic Alphabet. If the Sipokhi grapheme also has a determinative value, it will be listed in red beneath the grapheme. A more detailed explanation of the Sipokhi writing system is available in the orthography section of this site. The chart below shows a part of the native writing system for Idrani called Sipokhi. The Sipokhi characters are shown in large print. The red ones have both a sound and can be used to show a word category because they are picture-like. The sound for each sipokhi character is shown below it in black using the International Phonetic Alphabet. If the character also has the ability to categorize words, the picture it represents is also listed beneath it in red. You can learn more about the Sipokhi writing system in the orthography section of this site. The chart below shows the full phone inventory for the Idrani language using the International Phonetic Alphabet. Areas in the chart which are grey are considered to be impossible to articulate. You may click on the primary consonants in the first chart below and on the vowels in the second to the last chart below, to see articulation diagrams and hear pronunciation of the given phone. The chart below shows the all the sounds used by a native speaker of the Idrani language using the International Phonetic Alphabet. Areas in the chart which are grey are impossible to pronounce. Click on the main consonants in the first chart below and on the vowels in the second to the last chart below, and you will be able to see and hear how to pronounce them.